And now we have a blog. It was dark and I am pretty sure it was winter. It was cold. I was in a cow shed and the year was 2013. Vets 1 had just launched. 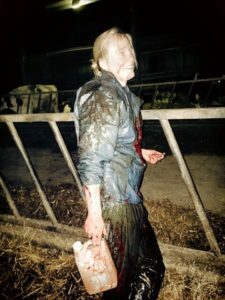 I was holding one end of a rope that was secured around the ankle of a pregnant cow. She wasn’t small. If you think two 1950’s VW Beatles stitched together you are probably not far out. Mrs Cow was pissed off and was resorting to violence. Baby Calf was stuck. Katharine had one complete arm (finger tips to shoulder blade) inserted and was in the process of trying to attach calving ropes to the little fellows legs. Mrs Cow took offence at this intrusion and was repeatedly aiming her hind leg with ever increasing accuracy at Katharine’s right hip. The attached rope was an attempt to keep this weapon of a leg on the ground and with each lift, aim and fire I was demonstrating that my upper body strength was indeed, pretty useless. I was already mapping out in my head how I would cope with the guilt of allowing a cow to ruin Katharine’s leg and possibly her career. I was convinced I was going to die. Or if I didn’t die, I was convinced Katharine was going to die. I was wrong I guess. Neither of us died. But it was a close thing. Mrs Cow didn’t die either and her calf is now probably a large, strapping hunk of a Bull skipping around a field or acting in commercials for butter manufacturers. This is a nice thing to imagine despite the fact that he was a born a beef cow and in all likelihood is now……maybe we don’t need to discuss it. A lot has happened since 2013. A lot has changed. We no longer fix cows or friends of cows, like pigs, or sheep. Instead, we concentrate solely on fixing dogs and friends of dogs, like cats or rabbits and occasionally a chicken. Which is good because even though we still like Cows, it is just a little bit safer helping a Pug give birth than an angry cow. Our small team of 4 is now a small team of 30. Our small dining room that was the Vets 1 home for the first 6 months of our business life has been replaced with a complex of beautiful barns that although pretty big, still maintains a small, family vibe ingrained into the soul of the bricks and beams. And now we have a Blog. To be brutally honest, I am not sure what I will write about weekly, but weekly, I will write something. There is no master plan (yet) and to be even more honest, I should probably be going for therapy on a weekly basis because running a vets practice eats away at your sanity. Alas, I just can’t find the time to lay on a strangers couch, so possibly I can use my ramblings here to help me think a bit straighter……. And here ends the first Vets 1 Blog Entry.